Hi There Doodlebug Friends! 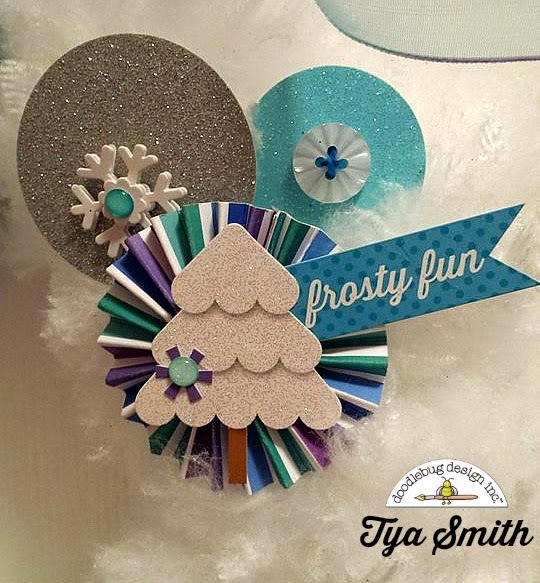 It's Tya here to share with you my Frosty Friends project. I just adore this line so much! So - I just have to say that I am so blessed to be surrounded by such inspirational and creative friends - I was totally inspired to make my project after I saw my amazing friend and Doodlebug Design Team Coordinator Lori Allred demonstrate how to make this adorable and absolutely super creative way to make this cute wreath on one of her upcoming My Craft Channel segments. If you haven't checked out her awesome Inspired by Pinterest shows you should! 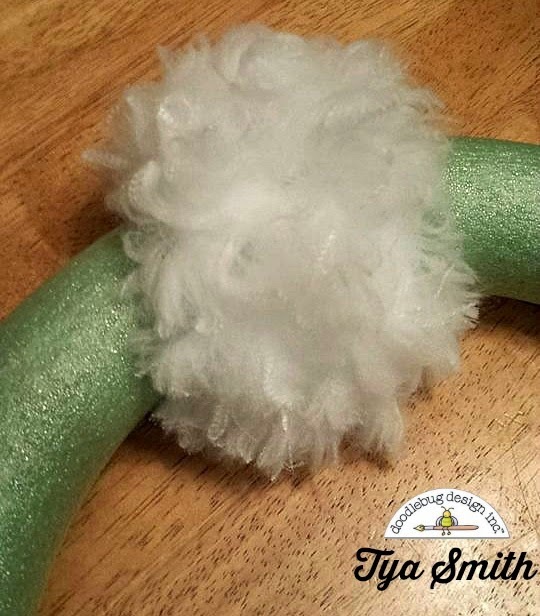 This wreath is make using a 12 inch foam wreath form and these microfiber dusters (like a Swiffer) that I picked up from the local Dollar Store! 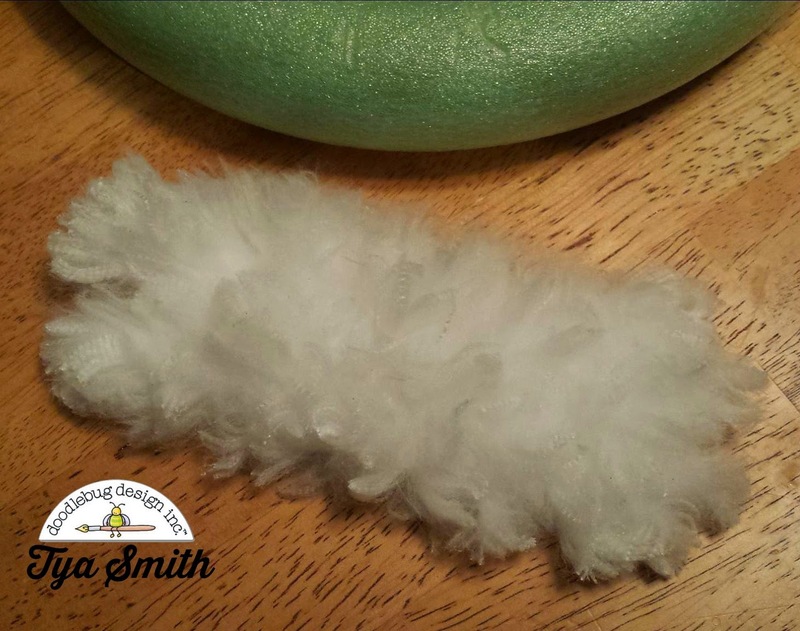 I LOVE how the dusters resemble a flock of fluffy snow! Perfect for the Frost Friends line! To make the wreath you just need to peel apart the duster portion. It comes apart very easily and you will get 2 of the strips like the one above, out of each duster. Then simply hot glue the dusters around the wreath form until it is completely covered. 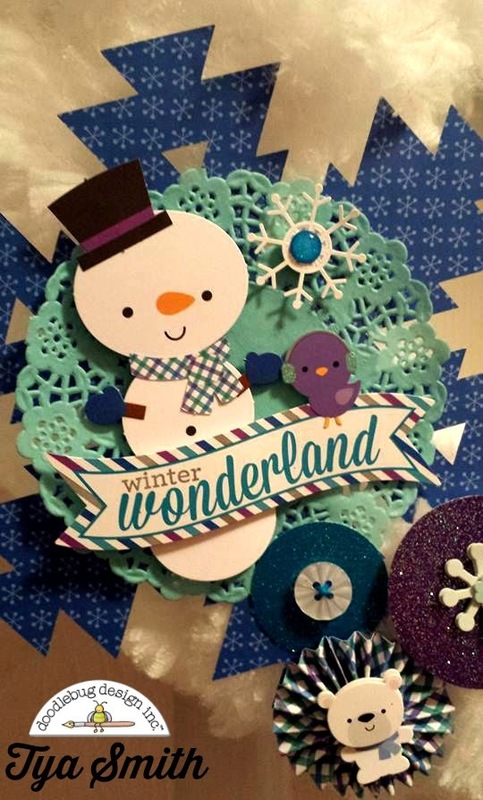 I then had a lot of fun using all sorts of elements from the Frosty Friends line - I cut out a huge paper snowflake from my Silhouette digital die cut machine and then layered a snowman from the Mix and Match Snowman Craft Kit. I added some stickers from the Frosty Friends This and That Sticker sheet and the Icon Sticker sheet. I then added some folded paper rosettes and topped them with some cute winter critters from the Frosty Friends Doodlepops. I also added some Winter Sprinkles and some Sugar Coated Cardstock circles that I punched out with some paper punches and added Snowflake Doodlepops and beautiful white buttons tied with bakers twine. Thanks for stopping by today and don't be afraid to think out of the box when it comes to crafting! 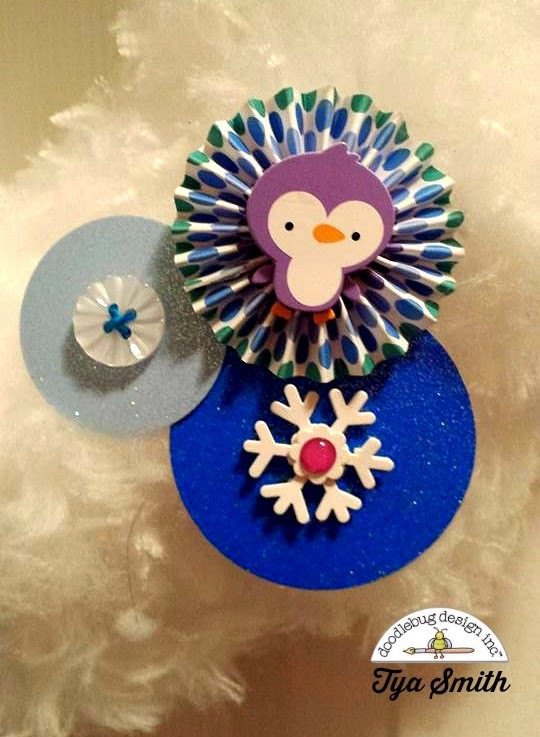 I had so much fun repurposing the dusters into a fun and fluffy winter wreath! Happy crafting! 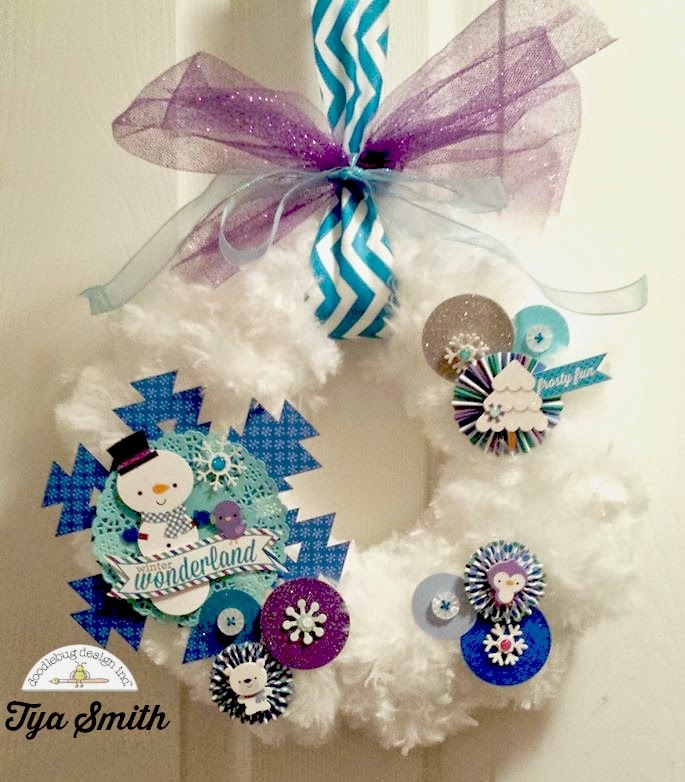 WOW - BEAUTIFUL wreath Tya and such a COOL & CLEVER design!!! THANK YOU for the CREATIVE INSPIRATION!!! Wow, what a clever idea! Your wreath is so cute! This is so cool Tya. Love it. That is a genius idea! I would never have guessed that you used dusters! This is so cute and such a great idea to use the duster. Super cute wreath, love the embellishments! What a fun and creative project! I love the design and all of the elements from the collection! The large snowflake is the perfect accent and I adore the doily and rosette! Such a fun and festive project! This is genius! and adorable!! I want several!! Totally darling Christmas wreath!!! Can't wait to try one too!!!! Thanks for the great inspiration Tya! Awesome Tya! What a great idea!! Pinned it! 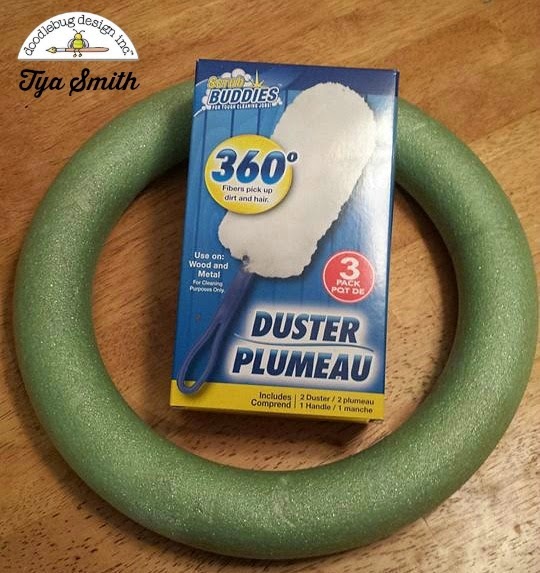 Such a money saving tip on those dusters...awesome!